Arctic foxes' numbers in the wild are dwindling due to temperatures increasing. As the ice recedes, two main factors are impacting their survival. The first major impact is as the temperatures in the arctic foxes' range get warmer red foxes are able to survive further north. Red foxes are larger and more aggressive. And they have babies to feed also. 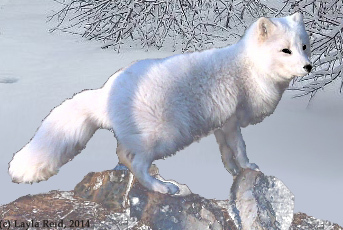 The smaller arctic fox is seen as competition by the red foxes. The arctics are often either killed or out-hunted by the reds leaving their babies to starve. While in lower states the red foxes and gray foxes live in the same range, this is because gray foxes have had time to adapt and evolve the ability to climb trees. Climate change is happening so quickly the arctic foxes do not have the opportunity to evolve new tactics to survive. Another drastic affect the warming climate is having is on the health of the polar bear. Though arctic foxes can hunt, food is scarce in the frigid arctic. This little fox does not stand much of a chance in competition with the larger predators in the area. So being the opportunists foxes are, they have learned to adapt by following polar bears and feeding on their leftovers. In many situations this has become their main source of food. The climate change has had a major impact on polar bear populations. Polar bears need ice to hunt. Less ice means less success in hunting for the bears which leads to less leftovers for the foxes and their babies. We are all intricately connected with each other on this planet. No other creature in the world has the same understanding of this fact and ability to affect it as we human beings do. We are the care takers of this planet, this home to us all. It is entirely up to us how we choose to care for it. We must remember to choose wisely.